Below is a version of the Composite cartoon, with arrows & labels showing which events are represented in the image. 1) I wanted viewers to know that they were entering a site that was Bible based & illustrated by a Christian. 2) I wanted viewers to immediately see the style of artwork that they would see on this website. Bible Composite 01 (an earlier version of the image). 1) All the illustrations I draw are taken directly from the Holy Bible. But I also wanted a single cartoon image that encapsulated & represented the entire Bible. The Bible is full of a vast array of different & diverse images, stories, characters, locations, situations, etc – I felt that there was no, single Biblical scene that could represent all that the Bible has to say. So I decided to create this composite cartoon, which takes 17 separate stories from the Bible, & inter-meshes them into 1 big picture. The design “starts” in the top left corner, with the Genesis account of creation. Genesis is the first book of the whole Bible, & the creation is the very first “story” of the Bible. You “read” the Composite cartoon from left to right, & from top to bottom. 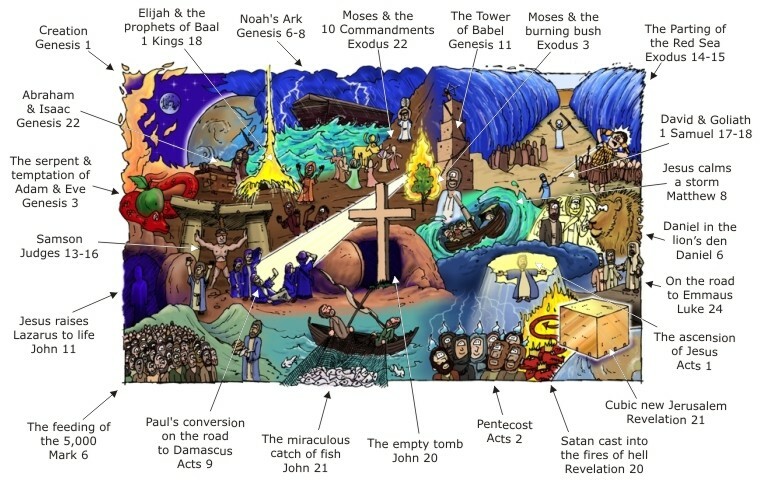 The top half of the image represents events from the Old Testament, whilst the bottom half represents events from the New Testament. The bottom right hand corner has the cubic new Jerusalem city, descending towards the Earth, which is the “story” found in the very last book of the Bible: Revelation. I chose probably the most famous, or well-known “stories” to create this Composite cartoon, which include Noah’s ark, the parting of the Red Sea, Daniel in the lion’s den, the feeding of the 5,000, the ascension of Jesus into heaven, & others. 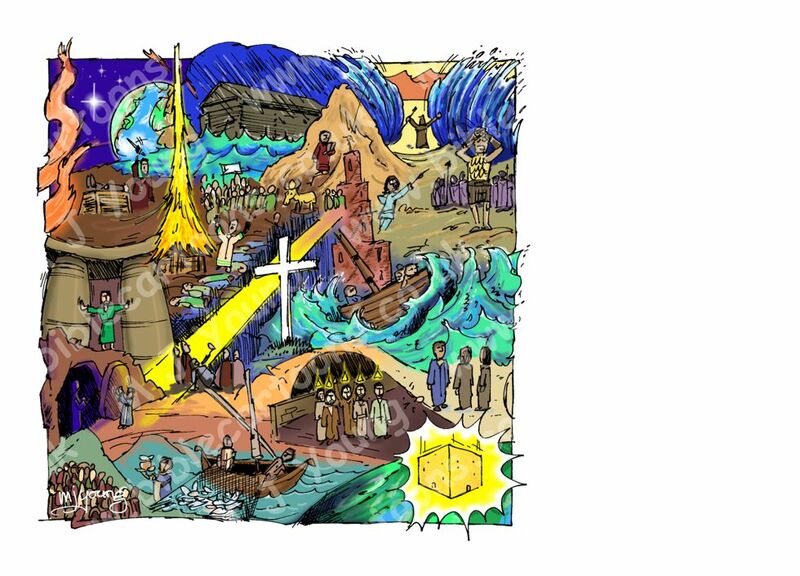 Right in the centre of the cartoon is the cross & the empty tomb of Jesus. Both of which are central to Christianity. The whole of history is divided in two by the cross: all ages before the crucifixion are termed BC (Before Christ) & all the ages since the cross are called AD (Anno Domini – Latin for “The year of our Lord”) which clearly states the centrality & importance of the cross. I wanted to include the empty tomb of Jesus in this cartoon, as the death of Jesus AND his resurrection are vital to the work of Jesus: atoning for all our sins, & gaining access to God to the Father, through Jesus’ death & resurrection. 2) I wanted the Composite cartoon image to act as an introduction to my cartooning style. I wanted visitors to this website to be able to see an example of my art style as soon as they landed here, & this illustration was a good example of my style at the time. Click here to see Bible Composite 02 image scene in Bible Cartoons, with notes & purchase options. Click here to see Bible Composite 01 image scene in Bible Cartoons, with notes & purchase options.